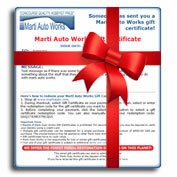 A Marti Auto Works gift certificate is the perfect gift for any occasion! Just purchase a gift certificate for the amount you wish and it will be emailed to you. You can then print it or forward it to your friend or family member so that they can use it at the Marti Auto Works website. You can personalize the gift certificate by adding your name and/or the recipients name. You can add a personal message to appear on the certificate.